Mistakes happen. No matter what workflows are in place, checks and balances fail and so can equipment. Companies don't maintain high review scores from being perfect, rather the high reviews come from resolving the issues. Great service is the core competency StickerGiant is built on. 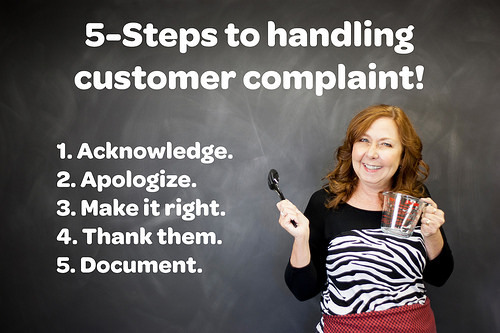 Check out our 3 Steps to Great Customer Service. Our focus is on great service but how we handle the complaints is where we thrill. Resolution means "the action of solving a problem, dispute, or contentious matter." At StickerGiant, we train all employees with Zing Train, which is Zingerman's unique approach to business. A key factor in Zing Train is the resolution of complaints. 1. Acknowledge the complaint. Nothing is more frustrating then being blown off when upset. We acknowledgement the problem by listening. We want to hear from you. 2. Sincerely apologize. Empathize with the customer. We put ourselves in your shoes to truly understand what you are going through. We care about satisfaction and thats why we have real people on the phones, email and social media to reach out to. 3. Make it right. Each situation has a different way to make it right. We respond to issues in a timely manner, ensure the quality of products and get them there when you need them. We want you to be thrilled with your stickers and labels. 4. Thank them. Thank you, thank you, thank you. You are the reason we are here and we love to make stickers for you. 5. Document the complaint. No business is perfect. However, in the pursuit of perfection, we try to never make the same mistake twice. Our team write downs what happened, reviews it with everyone and implements any changes necessary to avoid it for a second time. Following these few steps allows us to make sure that every sticker has a story. We aim to exceed your expectations to make your stories continue to happen. StickerGiant is all about producing high-quality stickers that you will love. StickerGiant guarantees your satisfaction. Check out some of our customer testimonials and review us on Google.